Wild: Elasmosaurus remuspissa has a strange role in the oceanic food chain. It almost exclusively hunts the smaller creatures in the waters, leaving most even moderately large creatures (such as humans) alone. The sheer size of the Elasmosaurus means that the quantity of creatures it must eat to sustain itself is nothing short of enormous. Domesticated: Much like the Brontosaurus on land, Elasmosaurus is an excellent way to transport large quantities of goods over water. These powerful creatures are in fact so large that they can be used as mobile water bases. Ambitious tribes sometimes build bunkers right onto the backs of Elasmosaurus instead of building cargo ships. 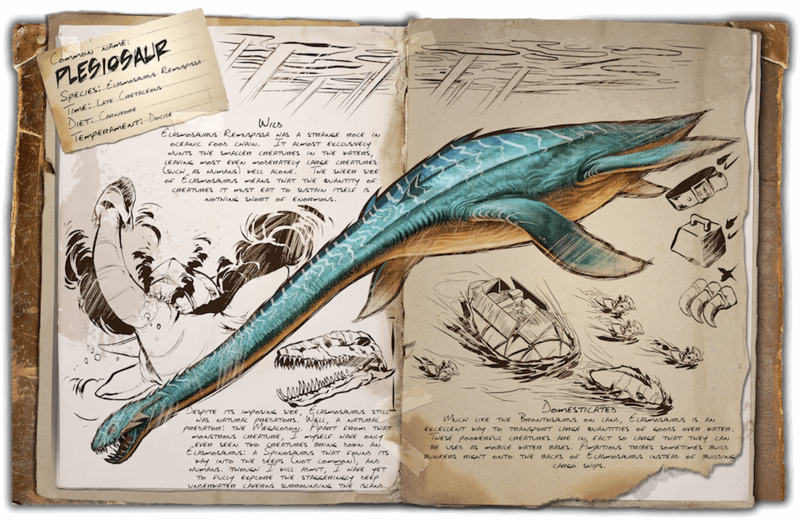 Known Information: Despite its imposing size, Elasmosaurus still has natural predators. Well, a natural predator: the Megalodon. Apart from that monstrous creature, I myself have only ever seen two creatures bring down an Elasmosaurus: a Spinosaurus that found its way into the deeps (not common), and humans. Though I will admit, I have yet to fully explore the staggering deep underwater caverns surrounding the island.